District Water and Sanitation Mission (DWSM), Majuli has issued a recruitment notification for filling up posts of SLWN Consultant/ CRC Coordinator/ Data Entry Operator. According to the District Water and Sanitation Mission (DWSM), Majuli Recruitment 2017 , the District Water and Sanitation Mission (DWSM) Majuli requires the following personnel for Majuli District. Eligible Candidates may attend the walk-in interview scheduled on 29/11/2017 from 9:30 AM onwards at DC Conference Hall, Garmur, Majuli along with application in standard form supported by original certificates and testimonials and Xerox copies of the same. 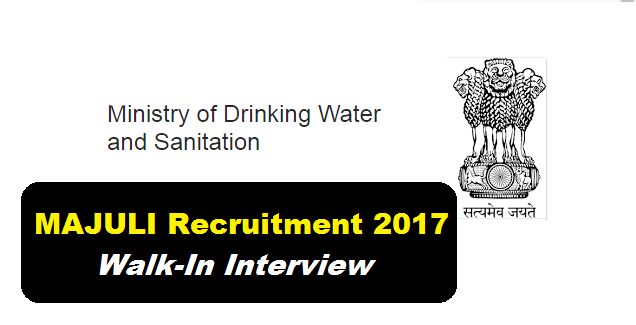 Following are the details of the posts under District Water and Sanitation Mission (DWSM), Majuli Recruitment 2017 with post details, number of vacancies, age limit, salary, required qualification with application details. Educational Qualification: Graduate degree in Civil engineering / Sanitation Engineering or a related discipline, at least 2 years of experience in environmental engineering, working on sanitation issues, preferably on solid and liquid waste management. Educational Qualification: Graduate degree in any stream from recognized university with basic computer knowledge. Age: 25 – 35 years. Educational Qualification: Graduate in any stream from recognized institute with 1 year Diploma in Computer. Interested and eligible Candidates should come for interview with all original certificate and testimonials. The engagement will be on contractual basis for six months and will be renewed subject to satisfactory performance of the incumbent. Candidate should be from Majuli District.